"Long ago, in the Second Age of history, a young Nain explorer by the name of Ven Polypheme traveled much of the known and unknown world, recording his adventures. Recently discovered by archaeologists, a few fragments of his original journals are reproduced in this book. Great care has been taken to reconstruct the parts of the journal that did not survive, so that a whole story can be told..."
Attacked by fire pirates, lost at sea and near death, Ven is rescued by a passing ship on its way to the Island of Serendair. Thankful to be alive, little does Ven know that the pirate attack--and his subsequent rescue--may not have been an accident. 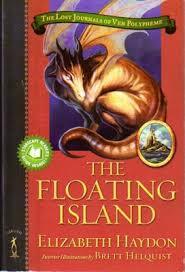 Shadowy figures are hunting for the famed Floating Island, the only source of the mystical Water of Life. They think Ven can lead them to this treasure, and will stop at nothing to get it--even murder. In a narrative that alternates entries from his journals and drawings from his sketchbooks, Ven begins the famous chronicles of his exciting and exotic adventures--adventures that would later earn him renown as the author of "The Book of All Human Knowledge" and "All the World's Magic."